AN UNPLEASANT confrontation with a mysterious creature has convinced Coast resident Ken Coulter a panther-like cat is hunting nearby. The retired former travel company owner couldn't believe what he found when investigating what was stirring up guinea fowl at his Ilkley property on Friday afternoon. "All you could see when you first went around the corner was the black top and shoulders," Mr Coulter said. "There were these ears and this face. "When it saw me it straightened up a bit. "Then it stood up and slunk off." He said the lower part of the animal's body was grey, similar to the tone of a wallaby. "The thing didn't run away. "I reckon it was about four or five times the size of a large cat." Mr Coulter said the animal was about 20m away from him on a path that led down to his dam. He said it moved like a lion. "Your first impression is you are seeing things. "It is a really surreal experience. "It wasn't a nice experience." His encounter is one of many the Daily has reported on in areas across the Coast. He said it prompted him to reference a 2014 Daily story that detailed an encounter with a panther-like cat at nearby Eudlo. "That photo is very haunting in the Daily and very, very similar," Mr Coulter said. 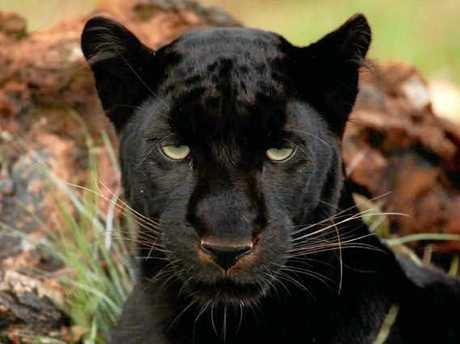 The image was a stock photograph of a panther. Wildlife experts have previously said it was very unlikely a member of the big cat family was living on the Coast. But Mr Coulter was sure of what he saw.